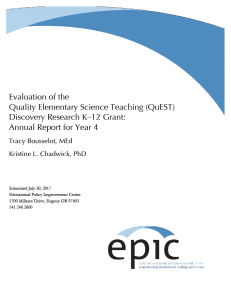 The Quality Elementary Science Teaching (QuEST) program is designed to deliver high-quality professional development (PD) in science content to elementary school teachers. QuEST includes both content and pedagogical instruction combined with a controlled teaching experience situated within a larger professional development context. The design of the PD is meant to provide meaningful and sustained changes in teachers’ knowledge and practice, in turn leading to improvements in student learning. Through better understanding of how various settings for teacher learning give rise to different kinds of knowing, the aim of the QuEST project is to develop a scalable model for implementing situated PD. Implement a high-quality situated PD model for K–6 teachers in science. Conduct a comprehensive and rigorous program of research to study the impacts of this model on teacher and student learning. Disseminate project outcomes to a variety of stakeholders to produce broader impacts.